After remaining silent for couple of months, here again well-known Pakistani hacker known to as 'Hitcher' from a hacker collective group named Pak Cyber Force (PCF) strikes. Hitcher is widely recognized for targeting and defacing high profile sites such as Govt, Bank, IT, University and so on. This time also he caught a big fish. The official website of World's largest Open Schooling system, widely known to us as The National Institute of Open Schooling (often abbreviated as NIOS, NOS or National Open School) get hacked. According to resources the hacker managed to get access on the web-server, and thus he manipulated the three domains of NIOS. In-spite of having full privilege, the hacker did not harm the main index. He just uploaded his deface page as shown in the picture. 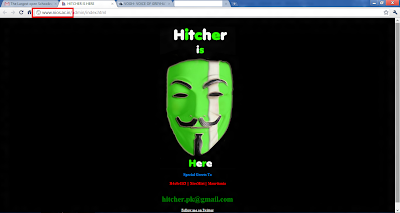 This cyber attack took place yesterday & still the deface page injected by the hacker exist on the web-server. We can conclude while predicting NIOS authority either overlooked the whole matter or else, they are still very careless in cyber-security. Brief About NIOS:- The National Institute of Open Schooling (often abbreviated as NIOS, NOS or National Open School), is the Board of Education for open schools in India. It was established by the Ministry of Human Resource Development of the Government of India in 1989 to provide education inexpensively to remote areas. The NIOS is a national board that administers examinations for Secondary and Senior Secondary examinations of open schools similar to the CBSE and the CISCE. It had a cumulative enrollment of about 1.5 million students from 2004–2009 at Secondary and Senior Secondary levels and enrolls about 350,000 students annually which makes it the largest open schooling system in the world.